A while back, we got our mitts on the full line of New Era Aquaculture fish food for an extensive product review. We received three different types of food (Aegis, Marine, and Algae), with each coming to us as both a flake and a pellet product. We spent the next several weeks feeding each of the six foods to our aquarium, trying to figure out which ones our fish would respond best to. Up to this point, we heavily favored frozen fish foods over all others, as they seemed to provide a more natural item for our fish to consume. But feeding the New Era fish foods had surprising results. We’ve never been huge fans of flake food. Not that there’s anything against flake food, but as we mentioned above, we just preferred more naturally looking foods. After all, fish don’t encounter dried flakes in the wild, and we strive to do our best to emulate nature whenever we can. But, we tried the flakes anyways. We initially expected some of the fish to eat them and others to ignore them completely. 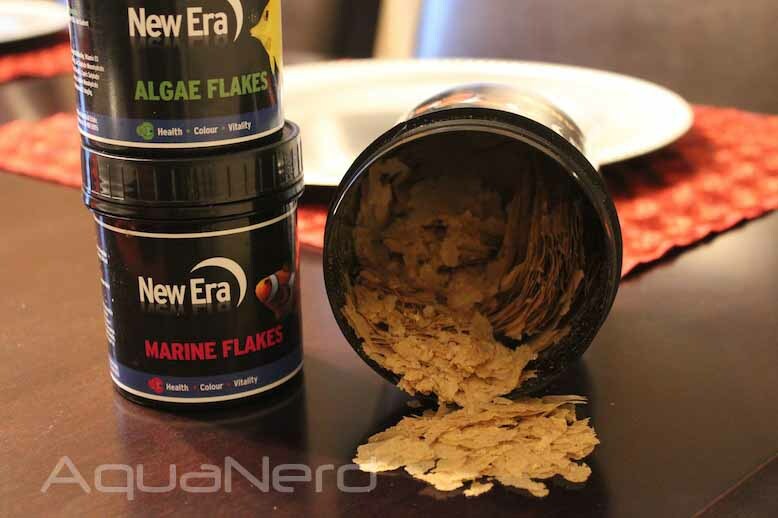 Surprisingly though, all of our fish went nuts for the New Era flakes, specifically the Aegis type. The first time we fed the flakes, our fish cautiously approached the food. But once they determined that the flakes were edible, they couldn’t seem to get enough. Our normally timid Kole tang would eat straight from our hands and the reclusive Rose Island dottyback was coming out in the open to aggressively eat. The fish overwhelmingly favored the Aegis flakes over the others, but would readily eat the Marine and Algae products as well. 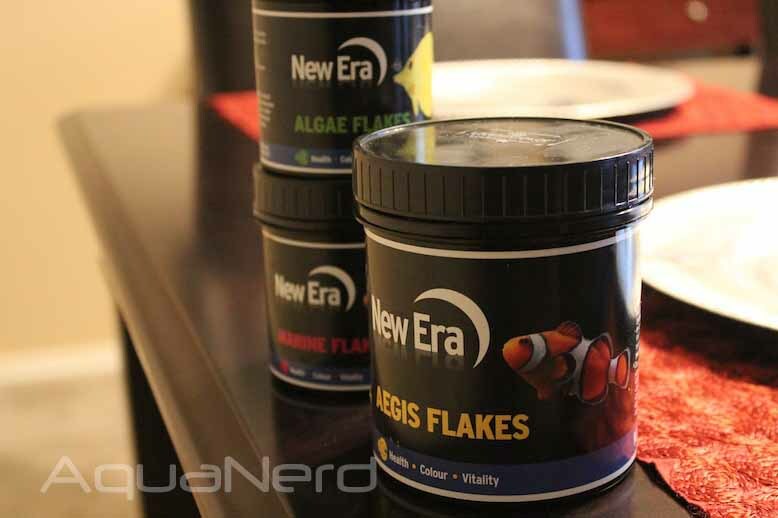 Because we like to vary the diets of our fish, we don’t feed the New Era products exclusively. However, since it’s so quick and easy to toss a pinch of dried flakes into the aquarium, we have come to rely on the food heavily. We don’t have to wait for frozen cubes to thaw, and our feeding time is reduced to mere moments where it once took a half hour or more. Not that thawing frozen food is a laborious process, but with the flakes we no longer have to wait and we bypass those annoying moments when we forget about the frozen food and leave them out all night. Believe us, there’s nothing stinkier than a cup full of rotting shrimp and algae products.